It listed personality traits, things I’d taught my son and done for and with him as he grew up, and things I’d helped both of them with. Many items mentioned funny memories from my son’s childhood. -Always helped with those last minute school projects at 2 a.m. The book arrived in the mail and I laughed…and I cried…with joy… alternating back and forth as I read each item. If a neighbor had looked in the window, he or she would’ve thought I was crazy! This extremely thoughtful present was absolutely the best gift ever. I pick it up and re-read it often. If you want to give an unforgettable gift to someone you love, I’d recommend creating a book like this. You can even get items for a list from your siblings, children, nieces and nephews and make a joint gift for your parents on a milestone anniversary. I guarantee anyone who receives this thoughtful gift will love it! This entry was posted in best gift, best present, gift that people love, gift-giving, gifts, no cost gift, thoughts tips and tales and tagged best gift, best no-cost gift, best present, gift-giving, gifts, gifts from the heart, no cost gifts, thoughtful gifts, thoughtstipsandtales. Bookmark the permalink. Great idea. I really want to get my friend a good gift. What a darling and amazing gift. thanks for sharing! I love making gift cards, they mean so much more!! Love the ribbons on the side!! I made a special gift at an online photo book-making site for my mom after we took her on a trip with us. She passed away, and I have it now. It had meant so much to her. What a delightful, thoughtful gift! You’ve clearly done a wonderful job parenting (and mother-in-lawing). I love this idea. So much nicer than the gift cards I typically give my parents. That is incredibly thoughtful and sweet! I did this a few years ago for my dad who kept saying he didn’t want or need anything. I included pictures to go along with the topic on each page. He loved it, and now that he’s gone I enjoy looking back at it and remembering not only those times but what it meant to both of us to share it. This is such a wonderful gift full of good thoughts and happy memories. You’re right – it definitely is! Passed on the good IQ!!! Lol. I adore this gift idea. I think I will make one for each of my children for Christmas. Everyone needs to hear their value; especially from the people who love them. Thank you for sharing at the #SHINEbloghop. 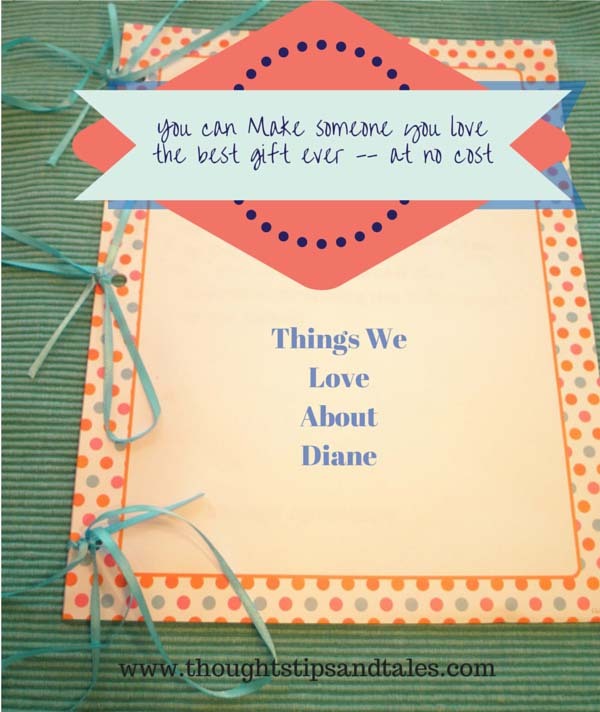 What a thoughtful and precious gift, Diane! Thanks so much for sharing this idea with us. We haven’t had the extra money lately to spend on gifts, so this is a wonderful alternative. I’m pinning it to my gifts board. Thanks, again. Thank you! I think anyone you give it to will love it. It’s something money can’t buy. Judy recently posted…Monday Handmade Linkup Party #41!! Thank you so very much!! I’ll add the info about your blog to my “Featured on” page. Really appreciate it! What a wonderful gift. So creative and thoughtful and a gift that keeps on giving. How amazing is that? I’m sure so many people would love to have one of these. I can think of a few people I would love to do this for, so thank you for the idea.